With the addition of our new Shoping software I have the ability for a new blog, so I thought I would make use of it. I have always enjoyed "thoughts of the day". As a way to begin to put the pieces together in regards to Complexity and Simplicity, there is now a Chocolate Alchemy Thought of the day which will be comprised of a general thought and I will take the time and space to also pass on a bit of information about chocolate making that I have learned over the past few years. In many cases, the information is already on the site. In some cases, it is just clarifying an issue. In all cases it is something that I know that I don't necessarily think about but that turns chocolate making from Complex to Simple. Let's start at the beginning shall we. Chocolate in it's purest form is made from ground up cocoa beans and sugar, refined to your taste. You can add many many things, but these are the only two things that are absolutely required. It was terribly complex to change over, taking more hours than I care to think about, but the previous shopping system was even more complex and disliked by more than just myself. This new system should make everyone's experience more pleasant. No more custom shipping quotes, no more waiting on me to calculate your order total, no more waiting on me to send you a payment request. It is all automated. I have been told most people don't read the introduction page to an ordering page. PLEASE (I am now down on my knees) read it. I put a lot of work into it, and it was not just to see my words in print. As you know, I don't always do things the same way as the rest of the e-commerce world. I like to think that the reason is that there is always someone (me) behind every order and correspondence and word on this website and that it has been thought out carefully and attuned to both your and my needs. That said, (getting up now) please read Shopping 101. It is there to make your life and mine easier. Finally, there are of course a few loose ends that I will tidy up over the next week. A few photos are missing, some of the out of country shipping rates are not in, and there are probably a few typos in there. If you notice something when you place your order, just note it in the Comments section in your Cart, and I will get it cleaned up if it is appropriate. And just because there is some automation, you are of course always welcome to email me if you have any questions, comments or need advise about something. I have attempted to make that a hallmark of Chocolate Alchemy, and I have no plans for that to change now. My laboratory door is always open. That is it. I want to give a heart felt thank you to everyone who has visited Chocolate Alchemy, put up with all the odd little (and sometimes big) quirks and kept coming back because you found it worthwhile. You will never know how much that means to me. Your humble and devoted servant. OK, I actually don't have anything to say about Simplicity, but the new dvd's and Digital Thermometer (perfect for tempering) are in Products . Briefly, it measures in both Celsius or Fahrenheit. The temperature range on this thing is amazing: -58 f to +1382 f ! It comes ready to go with a K-type thermocouple and a 9v battery installed. I have checked half a dozen for calibration, and at 0 C and 100 C, it was no more than 1 degree off, if that. Perfect for tempering. They (and the dvd's) are $30.00 each and in my opinion, would make great holiday gifts. I saw the quote the other day, and it struck a chord. I want you to think about that, and of course in particular in regards to making chocolate. I will be writing about that in a few days. Let's see if you come to the same conclusions I do. In the mean time, the Escali Scales are back in stock and with a higher 44 pound capacity (they were 33 lbs.). And to wet your appetite a little, we have in stock 3 chocolate handling (as opposed to making) dvd's. The first covers tempering and is really worth the price. Look for those in a few days. And to go hand in hand with the dvd's, we also have in a very handy digital thermometer with thermocouple (that is used in the dvd). The new organic and fair trade cocoa beans are now in the shopping system and available with full Reviews. I really hope you enjoy them. In addition, we have two different cocoa butters in. The "natural" cocoa butter is from the Dominican Republic, and is both Fair Trade Certified and Organic. It has the most amazing scent. This makes the most fabulous white chocolate, plus just a great addition to milk and dark chocolates. Going the other direction, the deodorized cocoa butter is now from Brazil, and is a bit more mild in comparision to the previous batch from Costa Rica. You may have noticed there has not been much apparent activity here lately. I have to tell you it does not reflect what has been going on behind the scenes. I am very pleased to announce that we are now offering four new choices of cocoa beans, all of them Organic and most of them Fair Trade Certified. The full reviews should be up over the weekend and they will be in the shopping cart early next week. If you simply can't wait, email me and I will let you know the pricing and I will happily take orders. The first that I am probably the most pleased about is from the Dominican Republic, specifically the Conacado co-op. If that sounds at all familiar, I am not at all surprised. It is one of the Single Origin chocolates that Dagoba produces. This is the same bean. It has been one of my favorite commercial chocolates and I have been wanting to carry it for some time, partly so I can have some direct comparisons between my chocolate making and a commercial chocolate. It is a luscious bean with a lot of complexity. There is no particular astringency, has a good clean flavor and actually reminds me a bit of the 2004 crop of Carenero Superior. The next is a fine flavor grade of cocoa from Madagascar. We briefly carried this origin a couple years ago, but sold out very quickly. I had the choice of two different lots this year and choose the one with a little more brightness and slightly better preparation. As I have found characteristic of this origin, there is quite a bit of bright fruit, in particular raspberry. It is a bit more subdued than the 2004 crop. The preparation on this bean is very clean and nice, and has an interesting red tone to the bean. This one is "just" Organic. I was suitably impressed by a Panama this year. In a similar fashion to Panamanian coffee this has a soft round profile. It doesn't have a huge amount of complexity, but oddly enough it is what I liked about it. There is fruitiness (apple and fig), earthiness (light leather), chocolate (you know this one, but slightly "dutch like") and a little balancing bitterness (just enough to balance). The one thing that stands out is that on first roasting I thought I had either over roasted it, or simply mis-roasted it. But after it rested a few days, the flavors really melded and rounded out. I have mentioned it in passing before that I like to let beans "rest" about 24 hours after roasting before I proceed to cracking or grinding. I would recommend at least 48 on this one. Finally, I have an origin that I have been per se resisting for some time. It is not really that I have not wanted to carry it, but hands own it has simply been bad every time I have tasted the origin. It seems most places that carry organic cocoa carry this origin, and I have never understood why – it is often bitter, astringent, poorly prepped and quite often just bad , but people buy it in droves because it is (trumpet sounding) ORGANIC. Well, as I have said often enough, I am all for Organic and Fair trade, but what matters to me is taste. Well this year's "Nacional" from Ecuador finally meets my standards of flavor. It is the most fermented Nacional I have seen. It still has a touch of purple, but is not waxing in texture like so many I have tasted. Even roasted lightly it has some "dark" flavors to it. There are some hints of roasted peanut, and the complimentary high notes that go with that. The is some astringency, but it is recognizable as a tannic like flavor, not unlike red wine The preparation is a little rough, a few flat beans, a few overly dried beans (they didn't stir the piles as often as they could have, and the outer beans dried faster) but in general it is ok.
Lastly, I have been receiving a number of requests for wholesale prices. I will be setting up a wholesale page that will be available those of you looking at maybe starting a small cottage industry. Wholesale accounts start at 25 lbs and full 60 kg bags are available at a significant discount off retail prices. I will announce when the page is set up, but in the meantime just e-mail me if you are interested in a wholesale account. On a minor other note, we have run out of the Stone Melangers WITH TIMERS. We still have plenty of the on/off switch models. One of the stages in chocolate making is peeling or separating the husk from the cocoa bean. This can either be done before or after roasting and is usually dependant on what kind of roasting equipment you have and whether you want to roast whole beans or nibs. For doing it at home, I did not like the option of hand peeling. I tried a number of pieces of equipment (meat grinders, rolling pins, grain mills) and either they could not handle the larger beans (in comparison to a grain of wheat) or it crushed the nib and husk so completely that the two powders could not be separated. The long and short of it is that I approached Crankandstein and they were able to modify one of their grain mills for use in cocoa - the Crankandstein Cocoa mill was born - "IT"S ALIVE" - sorry, couldn't help myself. In general, the Cocoa mill is what I suggest and recommend to people when they ask about peeling the cocoa or making nibs. It is a 3 roller mill meaning it has a pair of rollers set a particular gap to draw the cocoa in. One of those initial 2 rollers are also paired with a third roller to standardize the nib size during the crush. Finally, there is a slight differential in the gears between the two sets of roller - the effect of this is the pull the outer husk literally away from the nib as the rollers in each set move at a slightly different speed. The result is that you can crack about 4 lbs of beans in a minute and have a nice even distribution of nib size and large pieces of husk that are relatively easy to separate with a fan or blow dryer. After a couple of years, the idea came around that it might be possible to use the Champion Juicer to crack the beans into husk also and thereby reduce the amount of equipment (and initial capital expense) needed to make chocolate at home. **Legal Safety Warning: Champion Juicer and Chocolate Alchemy specifically concur and warn that this is a safety hazard - you are exposing the sharp rotating auger to fingers and is NOT recommended for standard use. Do so at your own risk. ** After a small amount of experimenting, I determined that by removing the bottom plate and running the cocoa beans through quickly, nibs and husk are shot out the bottom. 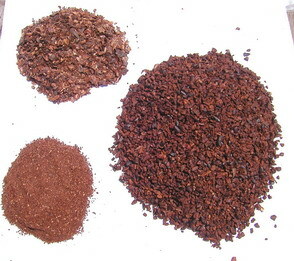 The result are nibs and husk that are a bit smaller than you get with the Cocoa mill and a fair amount of general dust. So, "Can I just use the Champion?" you ask. "I can live with smaller nibs, I am to be grinding it up anyway" you say. Well, that is up to you to decide. But what I will do is give you a little more data to make an educated decision upon. I cracked, sieved and winnowed a pound of roasted Cuyagua cocoa in the Cocoa mill and the Champion juicer. I filtered out any "dust" under 1 mm and winnowed the nibs in a bowl with a blow dryer, saving the husk for weighing. Here is what I found. And for you visually inclined, here are what those percentages look like. Same here. 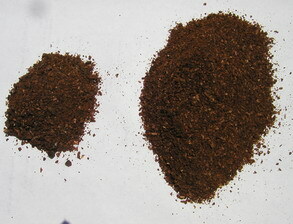 The Cocoa milled husk is on the left. Notice how much more intact it is. What is obvious to me is that the Crankandstein produces less dust, gives larger pieces of husk and can give you less waste in the end. The Champion makes dust of some of the nib that otherwise you could make chocolate with. Now, we are talking about only an ounce or so of "wasted" cocoa, under a dollars worth. Is that worth anything to you? Well, only you can decide that. I will mention three other pieces of data. 1) From a physical standpoint, I found it easier to winnow the Cocoa milled nibs. The larger pieces of husk blew away much easier and I did not have to contend with dust blowing in my face. Point Cocoa mill. 2) It took seconds to crack that pound of cocoa beans in the Cocoa mill (4-5 lbs/min) but about 1 minute in the Champion. Not a big deal for 1 lbs, but 10 lbs can be tedious. Two vs 10 minutes. Point Cocoa mill. 3) From other experiments, the Cocoa mill does not do a great job on raw/unroasted beans. It usually takes 2-3 passes to separate the husk sufficiently, and then you are still going to pick some out by hand. The Champion rips right through (with dust) raw beans. Point Champion. And then of course, do you want another piece of equipment? Point Champion. Or is that a point? If you don't have a Champion at all, you can make nibs with the Cocoa mill, winnow well, and use the Santha Stone Melanger as I described below to grind the nibs. Or you have the Champion, crack and grind with it (might as well grind with it if you have it) and refine in the Melanger. Either way you have two pieces of equipment. My personal recommendation is all three pieces. And no, it is not because I sell them. I don't play those kind of games. My duty here is to present information and tools and help you decide what path you want to take. I like the specialization each piece of equipment brings to the table, and the idea of using the right piece of equipment for the right job. A Mill for cracking - a grinder for grinding, and a Melanger for refining. But in the end, I understand it is a bit of money, and real world practicalities do rear their ugly head. Hopefully, I have given you a bit of information that will help you make an informed decision. In no small part to Chocolate Alchemy, Santha is now calling their motor ventilated wet grinders Chocolate Stone Melangers. So, I will probably start referring to them that way. So if you see mention to the Santha Melanger, or Stone Melanger, it is the Santha Wet Grinder made and adjusted for us chocolate makers. To distinguish it solidly from their other line, they will only be coming in maroon but there is now the choice of a 99 hour electric timer. The regular Melangers will still be $265 (including shipping in the 48 upper US states), but the timers will increase the price to $295. And since I have not spoken about them in a while, the non-timer units are also available in 220 v and we can handle out of country shipping. Shipping varies pretty wildly out of the country, so please write and ask if you want to know the prices. In general non-US units are about $50-100 more due to shipping. In response to a couple of customers innovation (thank you Alan and Brad), I experimented with my Melanger this weekend, testing out how well it handles taking grinding nibs. Both Alan and Brad have modified their Santhas to a larger motor and reported being able to bypass the Champion and liquefy the nibs directly in the Santha. Well, I am pleased to report that the stock Melanger can also do the job. I have not pushed it to a high capacity yet, but check out the photos below of 2 lbs of roasted Cuyagua. The main "trick" is that you run the unit with no spring, or no nut at all. The weight of the rollers does it all and it does not bind up. At the beginning, the nibs running freely.And if you have not seen it before, that is the hot new maroon color all Melangers are now coming in. At 30 minutes, the mass suddenly started to "flow". Still course, but flowing. 45 minutes and it is quite fluid and getting smoother almost as you watch. One hour and we are where we would be with the Champion (except the few nibs that need to be scraped down). All I did was put the rollers in, without even the top nut. I started the Melanger and poured in my WELL CLEANED (more on this later) nibs. After 15 minutes, I could tell something was happening. Thirty minutes in it started flowing and after an hour, everything was nice and smooth. I added the cap around 15 minutes, but I don't think it matters. I did not add any external heat at all - just the weight of the rollers and friction took care of it. OK, Great you say - I don't need to buy a Champion Juicer. Well, frankly that depends on you. By using the Melanger only, you need to make sure your nibs are VERY clean of husk because you have nothing filtering it out. In the Champion, the liqueur comes out the bottom, and any husk you have left in, comes out the front. By eliminating the filtering step, the onus is completely on you (if you get nibs from me, they WILL have some husk left) to make sure it is all gone or at a level you can accept. The up side is you don't loose anything to the void in the Champion. If you put in 1 lb 6 oz of nibs, you have 1 lb 6 oz of nibs, not somewhere around a 1 lb like in the Champion. So, until I do more testing, and tasting, I will reserve judgment which method I like best, but regardless, there you go - another option in your Alchemical bag of chocolate making tips and tricks. You may have noticed I have been a little absent here lately. Actually, a lot has been happening behind the scenes. From the notes below, you can see we had our site and email go down for a while. One of the unfortunate consequences is the email Newsletter member's list has been partially lost. I have a record of everyone who subscribed (exception is those who subscribed since June 20 - I didn't realize the list was down, so those did not "go through"), so I will be getting those re-entered and the Newsletter active again. If you did subscribe in the last few weeks, keep an eye here, and please re-subscribe when I have it working. On a similar note, when our email when down, the entire server was lost, so we did not receive quite a number of emails for two reasons: 1) the server overloaded and a number of emails were bounced; 2) we failed to establish the primary email we use for contacting us (contact at chocolatealchemy dot com). So, usually, we take GREAT pride in answering ALL emails. I you have written and not received an answer in the past few weeks, please write again. We now have a new server and the email is all fixed. Now, on a chocolate note, the new Santha Wet Grinders are due to be in next week and all back orders should be out by the end of the week. We also have run out of a couple of varieties of cocoa beans recently. We are out of the Carenero Superior (a usual staple), the polished Jamaican Trinatario and Ghana Forastero. There is plenty of stock of the Cuyagua and Ocumare (both Criollos from Venezuela) and the Papua New Guinea is a nice change that I really recommend. On the new front, we finally have Fair Trade Ghana Forastero on the way (available in a couple weeks), and have started our Certified Organic certification for carrying Organic Cocoa. That is about it. Happy chocolate making everyone. We are currently out of stock of the Santha Wet Grinder. Even though it is marked "out of stock", if you want one when they come in, you are welcome to place the order (and please tell me if you want to pay now or later) and you will get it fresh off the boat. Also, there are a couple of nice things with the next batch. Rumor has it that Santha will now be calling these Alchemist Stone Chocolate Melangers. I feel honored. Mostly it will be the same unit, except for two changes for the better. There will be a integrated 99 hour timer available and due to a little prompting from yours truly, they have improved their wiring. If you ever saw inside some of the originally, they were a little less than professional. Frankly, I was just glad to have a machine that would let us make chocolate, but I am very happy they are taking constructive suggestions and implementing them. OK, you "do it yourselfers". Being a chocolate alchemist sometimes means making your own equipment. Well, I am going to be building a new cocoa roaster for myself (actually for you, it is for your Kits) and I thought it might be nice for people to follow along and maybe build their own. Now before you start thinking, no way, I can't do that just ask your self if you can use a few basic tools. Circular saw, jig saw, drill? If you can do that, then you can build the roaster I have planned. No fancy lathes, or heavy metal working tools. Just simple, efficient, cost effective construction. So, if you have an interest, or just want to follow along, head over to the Forum, under the Roasting section in the Home Roaster thread. Ok, so the title is a little odd. I heard the song on the radio today and it stuck with me. Anyway - lots of new stuff. We have two brand new cocoa beans types in. There is fabulous Criollo from the Cuyagua region (near and like Ocumare) in Venezuela. This is what Criollo is all about and what everyone claims to have (but rarely do). It is fruity, delicate, chocolatey and it is without a touch of bitterness or astringency. The other is virtually the opposite. It is a smoky (dried over wood fires), heavy, deep Forastero (with a little Trinatario) from Papua New Guinea. We are now carrying de-odorized cocoa butter (in addition to the Natural still) and the molding syringe I use when I make my own chocolates. I am back from the IACP conference in Seattle. It was a lot of fun and quite exhausting. I met a lot of wonderful people, was able to put faces to a number of names and generally had a good time. While there I was interviewed for a podcast. You can see a couple photos of the booth we had, a picture of yours truly and hear the podcast at Don Genova's "Pacific Palate Blog". I am going to have a booth the International Association of Culinary Professionals showcase this Friday in Seattle Washington. I spent the weekend tempering and molding up nearly 20 lbs of various chocolates to give away. Please stop by if you are in the area (there is probably a day fee). In addition, that means I will not be answering emails 'promptly' nor processing any orders from Wednesday evening until Monday. In the mean time, have a look at Chocolate in Context for some extra chocolate reading. I probably receive a request a week from people wanting to make milk free "milk" chocolate. After a bit of experimenting, some suggestions from various customers and numerous taste tests, I am really pleased to submit the following two recipes for those with milk allergies and/or sensitivities. My daughter can not consume anything with cow's milk, but does just fine with goat's milk, so this recipe is for her. This formulation will make almost 7 pounds of "40 % cocoa" Goat's milk chocolate. Roast the cocoa beans until just cracking. I do this in a drum roaster, 320 F for 15-20 minutes. I like this bean a little lighter roasted, but roast to your tastes of course. Only you know what you like. You might try 325 for 20-30 minutes for a little roasty flavor. Crack and winnow the beans - you should have about 30 oz of nibs remaining. Grind in your Champion juicer. Go ahead and add your cocoa butter and lecithin at this time, mixed with some of the trace husk you have running back through. Place your Cocoa liqueur and butter mixture in your Santha Wet Grinder. It is very helpful to have your solid ingredients warmed up to at least 120 F, including the Santha drum. Slowly add the sugar and Goat's milk powder into the melted cocoa liqueur while the Santha is running. Run the Santha until the chocolate is of the smoothness you desire. I find 12-16 hours is about right. Your tastes may vary. If you pre-grind your sugar in a small food processor or coffee grinder (about 2 minutes work), you can usually reduce refining time by 3-4 hours. After it is out of the Santha temper and mold up your chocolate into the shape of your choice. Place into a cool, dry place to solidify and then unmold, ususally about 24 hours later to be safe. This can be done in a refrigerator if you wish. Let the chocolate rest for another 24 hours before eating (well, eat it earlier, but it does benefit from the rest). For others that can't abide any dairy products at all, I submit the best soy "milk" chocolate you will ever taste. This formulation will make almost 5 pounds of "40 % cocoa" "Better than Milk" Soy milk chocolate. Place your Cocoa liqueur and butter mixture in your Santha Wet Grinder. It is very helpful to have your solid ingredients warmed up to at least 120 F, including the Santha drum. Slowly add the sugar and soy milk powder into the melted cocoa liqueur while the Santha is running. Run the Santha until the chocolate is of the smoothness you desire. I find 12-16 hours is about right. Your tastes may vary. If you pre-grind your sugar in a small food processor or coffee grinder (about 2 minutes work), you can usually reduce refining time by 3-4 hours. I hope you really enjoy them. Please let me know. If you don't happen to know, the AlChemist here is also an actual Chemist. For a while now, tempering has been bothering me. Or more to the point, the lack of clear scientific information. Sure, there is a bit out there about the different forms of cocoa butter, and how you are forming a particular form (type V) that gives chocolate its characteristic snap and gloss. But there is still a lot of mystique, intrigue and lack of true explanation. Well, after quite a bit of reading and thinking, I think I have both an explanation as to what is actually happening, step by step, in the tempering process and why it works. So, without further delay, this is what I have worked out, pieced together and tested. It has lead to what I think is a new way to temper, and it involves a piece of equipment you most likely have if you are making chocolate from scratch - the Santha Wet Grinder. And it is very simple - I have tested it a number of times and so far, it seems just about fool proof as long has you have a reasonably accurate thermometer. But I will get to that at the end. On to a little theory. You may have heard how cocoa butter forms into various "polymorphs". Well, it is a simple enough term, but I can't say it is very approachable. Poly means many, morph means shapes. So cocoa butter can take on many shapes - and we don't mean in molds here. The molecular (there I go being unapproachable) form can take on many shapes. Think of a cocoa butter molecule as a long stick, not unlike a Lincoln log. There are LOTS of ways to stack them together and some are more stable and stronger than others. If you take the whole box and just dump them on the floor, you will get a very loose pile that is "soft". If you push on it, it is going to move. That is like "polymorph I". It is a very soft form of cocoa butter as there is very little structure to it. It is what you get if you just let the cocoa butter cool or cool it very quickly. I could go WAY into the analogy here, but suffice it to say, if you take your time, stack each log up and interlock it with the one below it, your whole structure is going to be strong and stable. That is "polymorph V" or tempered chocolate. Now, I found the following chart. I really don't want you to read it to carefully as in my opinion there is just too much information there. I want you to look at the melting points - that is the key to what we are going to do. form I 63.1/17.3 Produced by rapid cooling of melt. Successive polymorphs are then obtained sequentially by heating at 0.5 °C/min. form II 73.9/23.3 Produced by cooling melt at 2 °C/min or rapid cooling of melt followed by storing from several minutes up to one hour at 0 °C. This form is stable at 0 °C for up to 5 hours. form III 77.9/25.5 Produced by solidification of melt at 5-10 °C or transformation of form II by storing at 5-10 °C. form IV 81.1/27.3 Produced by solidification of melt at 16-21 °C or transformation of form III by storing at 16-21 °C. form V 92.8/33.8 Produced by tempering (cooling then reheating slightly while mixing). The most desirable form with good gloss, texture, and "snap". form VI 97.7/36.3 The transformation of form V after spending 4 months at room temperature. Leads to the white, dusty appearance of "bloomed" chocolate. What it all comes down to is that if you let cocoa butter just slowly and naturally cool, you are going to get a mixture of types I-V (no VI as it takes months). The slower you go, the more type V you are going to get as the others can't really form if the mixture is too hot - they just "melt". So at 30 C, about all that is going to form is type V. Now, notice I say "about". Those numbers are great in theory, but in practice, a little of all of them form at all temperatures - it is just one of those crystallization/equilibration theory "things" that I took 3 months in 2nd year Organic Chemistry to really study and understand. So, if we take some melted chocolate (untempered - no structure at all), and let it cool slowly, type V "crystals" will start to form as it cools, then IV, then III, then II, then I. What have we gained - all we have is this mass of soft chocolate with all the forms. Yes and no. What we have is a soft mass with quite a lot of type V crystals "contaminated" by the other forms. What happens if we heat this back up to 32 C? All the forms except type V melt and we are left with what is effectively type V "seed" chocolate. If you then add this to a batch of untempered chocolate that is UNDER 92.8F/33.8 C (the melting point of type V), the cocoa butter present will start to form around the seed crystals very nicely and preferentially give you 90+% type V cocoa butter. There WILL be a little of the other forms present (that whole crystallization/equilibration theory "thing") but the majority will be type V and you will have tempered chocolate. Now, I know in "classic" tempering you stir, and scrape, and sheer and yadda, yadda, yadda. If I did that in my Organic Chemistry lab while forming crystals I would have failed. It works sometimes, but mostly it is unpredictable (hrm, tempering unpredictable, naaaa). What I always learned was to form a seed crystal, set your conditions correctly, then TAKE YOUR HANDS OFF. So many people wanted to "help" the crystals form - all they did was break them and make a mess. So, based on all of that, this is what I have developed for tempering with your Santha. It looks more complicated than it is - I like to give plenty of detail. Place the chocolate on a plastic wrap covered plate, cover the plate and put it in the oven or other semi-insulated place to slowing cool. (you are forming all the crystal forms here, with an advantage to the type V by cooling slowly). Let the seed chocolate set up a few hours. It will be quite soft as it is "contaminated" by type I-IV crystals. Don't touch it, stir it or bother it - it knows what it is doing. Once it is solid and you are ready to temper and mold up, remove the seed chocolate and chop it up into small finger nail sized pieces. Verify the chocolate in the Santha is between 90-95 F. If colder, just run it a few minutes and it will heat up. If hotter, let it cool. Add it to the rest of your chocolate in the Santha, turn it on a minute or so to mix it, then turn it off so the seed chocolate can melt. This is the advantage of the Santha. It will distribute the seed chocolate very well. Turn the Santha back on and verify the temperature of the chocolate once it is all homogeneous. You want it technically anywhere over the melting point of type IV (81.1 F) and under the melting point of type V (92.8 F) . Practically, assuming your thermometer is not perfect, a goal of 88-90 F is nice. If it is a little too cool, turn the Santha on a little to heat it up. It really should not be too warm since you are adding room temperature seed chocolate to chocolate you have verified to be no warmer than 95 F.
After everything is homogenous, it is your choice how to withdraw your chocolate. I prefer to turn the Santha off, withdraw a syringe (soon to be offered for sale) of chocolate, turn it back on, and fill my molds. Then repeat - off - fill - on - dispense. During this procedure I take off the nylon nut so the chocolate is mixing but not heating (no friction means no heat). That is all there is to it. Finally a couple quick molding notes. Polish your molds with a clean dry towel. I found no advantage to rubbing with cocoa butter - it did not help nor harm the final release or gloss. Let the chocolate set up at room temperature - give the Type V crystals plenty of time to form. If you force cool, you run the risk of forming other forms and softening your chocolate. After the chocolate is fully set up, put them in the refrigerator 1/2 hour or longer, then unmold immediately. This really helps the chocolate release from the molds effortlessly by contracting it just a little. Well, it was a short break. The new crop of Ocumare is in. It is extremely similar to the 2005 crop, to the point that I probably will not get to the review for a little while (technically it is a "late" 2005, and what we had before was early). And just a little other news - we will probably be up and down (especially the ordering system) for the next couple of days. We are moving servers and fixing some minor problems. Also, if you are thinking about getting a Santha in the near future, you may wish to do so quickly. We have under 10 in stock and the next batch will not be in until around the beginning of May. But when they do come in they will have the much awaited 99 hour timer (the manual switch will also be an option still). I am not going to take them off the cart, but will simply mark them "backordered" and continue to accept orders. Finally, the Forum seems to be a hit. So if you have not checked it out, please do. As promised, the new Escali Scale is now available. It has a 33 lb capacity and is what I have been using for quite some time. I have also swapped out a couple of the molds. The Bar mold is more of a classic look now - 4 oz and you get three per mold. And the truffle mold is now a little less expensive and I like the shape better. Please, go have a look. Oh, and this is not something I am offering, but something I found and wanted to share.